With our herb garden getting fuller and weather getting warmer(more like hotter), I've been feeling the urge of using a whole bunch of herbs for dinner lately. 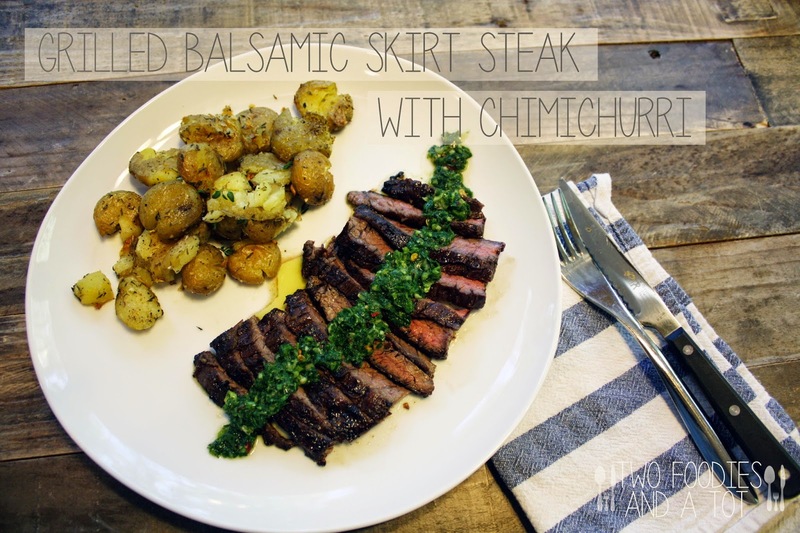 Chimichurri is the perfect fit. I am loving this weather that enables the use of BBQ, because the whole house won't have to smell like steak or whatever I am grilling, with the dog running around the kitchen area as if she saw some kind of madness happening. 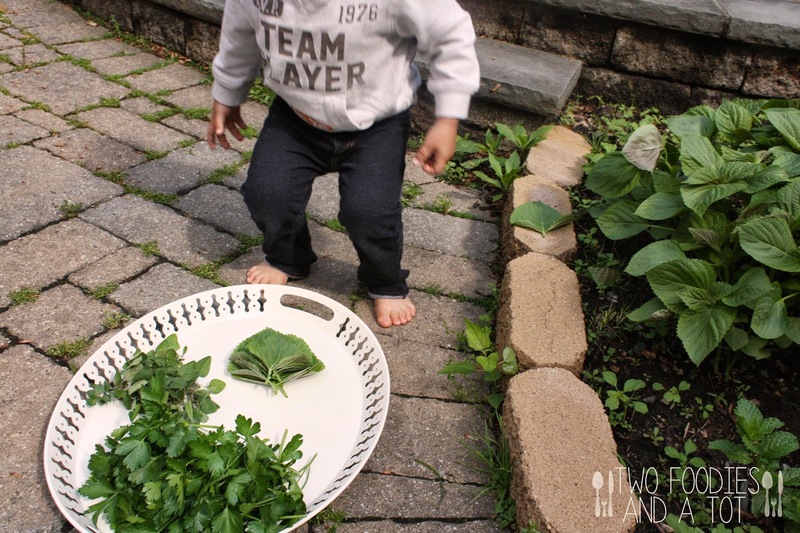 My little helper helped me getting some parsley and oregano from the garden. The big leafy stuff on the right corner is called perilla which is commonly used in Korean cuisine. They're very fragrant and delicious, fantastic with Korean BBQ. But you can only find them at Asian supermarkets so even in NYC, I planted some of them in the roof top garden. They are getting big, I should cook with them soon too. Skirt steak can be very tough when they're overdone(like any steak) but when it's done perfectly it is amazing. 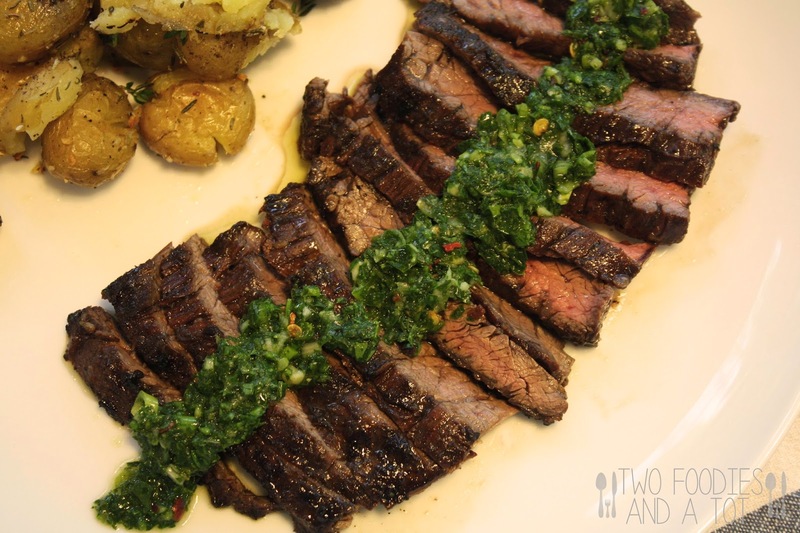 With flavorful chimichurri adding freshness to the tender steak, it is just so delicious. 1. Mix all the marinade ingredients and marinate for at least 30minutes. 2. For chimichurri, place parsley, oregano and garlic in the food processor and pulse. Put them in a bowl and add oil, vinegar, salt, pepper and red pepper flakes and mix well. 3. On a heated grill, cook the steak to your liking. I like mine medium and it takes me about 3minutes per side. When done, cover with foil and let it rest for about 10minutes. 4. Move the steak to a cutting board and slice against the grain. Otherwise you'll be left with tough bites. 5. Top with chimichurri sauce and your choice of side and serve.